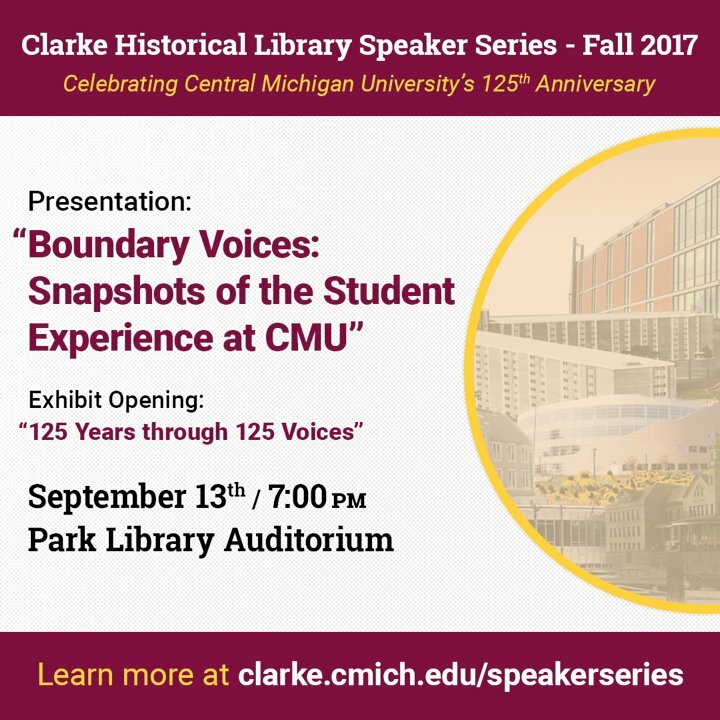 Join two of our deparment's faculty members, Jay Martin and Brittany Bayless Fremion, September 13 at 7:00 p.m. in the Park Library auditorium to open the Clarke Library’s new exhibit, “125 Years Through 125 Voices,” which celebrates CMU’s 125 anniversary. Brittany and Jay’s topic, “Boundary Voices: Snapshots of the Student Experience at Central Michigan University,” will draw upon their extensive oral history project with CMU students. A reception inside the Clarke Library, where you will also have an opportunity to view the exhibit, will follow the presentation.